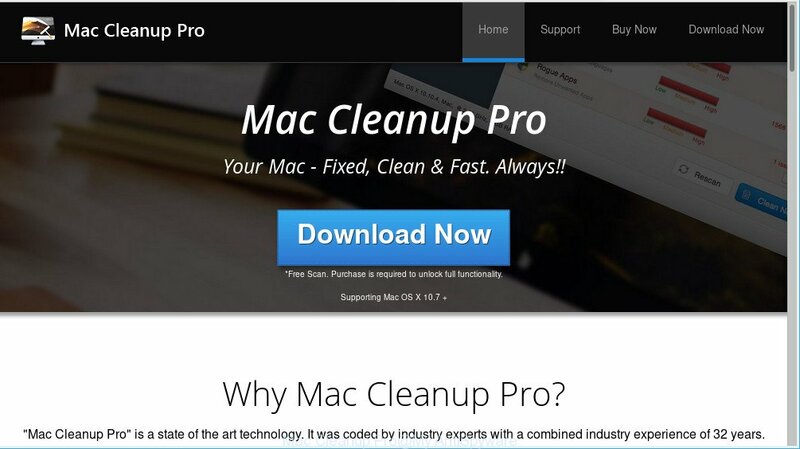 What is Mac Cleanup Pro? Security specialists have confirmed that the Mac Cleanup Pro is a a potentially unwanted program (PUP). It is named “Mac Cleanup Pro” claims to help users remove unnecessary apps, clean disks, find and remove duplicate and junk files. Once started, the Mac Cleanup Pro makes changes to the Mac system settings and configures itself so as to start automatically each time the computer is turned on. Immediately after startup, it will perform a scan of whole system and detect a lot of problems. The Mac Cleanup Pro will offer to purchase its full version to try to fix these problems. Moreover, this PUP will change your MAC settings to periodically display various annoying pop-ups, alerts and warnings. Potentially unwanted programs are usually written in ways common to malware, spyware and browser hijackers. In order to remove Mac Cleanup Pro, you will need perform the following steps or run free removal utilities listed below. There are several steps to removing Mac Cleanup Pro, because it installs itself so deeply into Apple Mac. You need to uninstall all suspicious and unknown applications, then reset your web browser settings to remove any changes Mac Cleanup Pro has made. Finally, you need to check your computer with MalwareBytes to ensure this PUP is fully removed. It will take a while. The useful removal instructions for the Mac Cleanup Pro PUP. The detailed procedure can be followed by anyone as it really does take you step-by-step. If you follow this process to delete Mac Cleanup Pro potentially unwanted program let us know how you managed by sending us your comments please. First method for manual PUP removal is to go into the Finder, then Applications. Take a look at the list of software on your MAC OS and see if there are any dubious and unknown programs. If you see any, you need to delete them. Of course, before doing so, you can do an Web search to find details on the application. If it is a potentially unwanted application, PUP or malicious software, you will likely find information that says so. Make sure you have closed all internet browsers and other programs. Next, uninstall any unwanted and suspicious programs from computer using the Finder. Look around the entire list of apps installed on your machine. Most likely, one of them is the Mac Cleanup Pro and other PUPs. Select the questionable program or the program that name is not familiar to you and uninstall it. Annoying Mac Cleanup Pro pop-ups or other symptom of having potentially unwanted program in your browser is a good reason to reset Google Chrome. This is an easy method to restore the Google Chrome settings and not lose any important information. 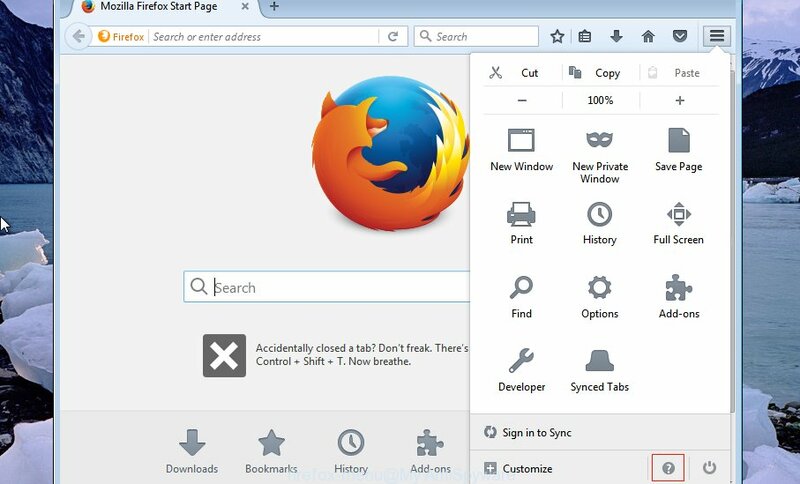 By resetting Safari web browser you restore your browser settings to its default state. This is first when troubleshooting problems that might have been caused by Mac Cleanup Pro PUP and other unwanted applications. Now, click the “Extensions” tab. Look for dubious plugins on left panel, select it, then click the “Uninstall” button. Most important to delete all suspicious extensions from Safari. Once complete, check your start page and search engine settings. Click “General” tab. Make sure that the “Homepage” field contains the website you want or is empty. This step will help you remove Mac Cleanup Pro pop-ups, third-party toolbars, disable harmful add-ons and restore your default home page, newtab page and search engine settings. There are not many good free PUPs removers with high detection ratio. The effectiveness of removal utilities depends on various factors, mostly on how often their PUPs/virus/malware signatures DB are updated in order to effectively detect modern malicious software, adware, browser hijacker infections and other potentially unwanted software. We suggest to use several programs, not just one. These programs that listed below will allow you remove all components of the PUP from your disk and system folders and thereby delete Mac Cleanup Pro. We recommend using the MalwareBytes Anti Malware. You can download and install MalwareBytes Anti Malware to find outthe Mac Cleanup Pro from your Apple Mac. When installed and updated, this free remover automatically searches for and removes all threats exist on the computer. Installing the MalwareBytes Anti Malware (MBAM) is simple. First you will need to download MalwareBytes Free on your machine by clicking on the following link. After the downloading process is finished, close all windows on your MAC. Further, open the saved file. Follow the prompts. The MalwareBytes Anti-Malware will automatically launch and you can see its main window as displayed in the figure below. Next, press the “Scan Now” button to perform a system scan for the Mac Cleanup Pro and other unwanted software. During the scan MalwareBytes will scan for threats exist on your MAC system. Once finished, MalwareBytes AntiMalware (MBAM) will display a scan report. Next, you need to click “Remove Selected Items” button. 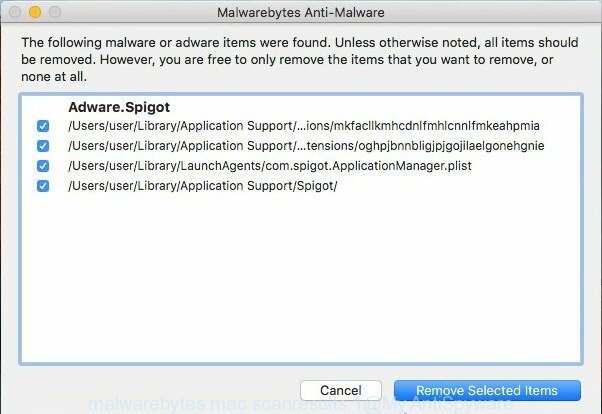 The MalwareBytes AntiMalware will remove Mac Cleanup Pro PUP and other unwanted software and add threats to the Quarantine. If you browse the Internet, you cannot avoid malicious advertising. But you can protect your web browser against it. Download and use an ad-blocker application. AdGuard is an ad-blocker which can filter out a lot of of the malicious advertising, stoping dynamic scripts from loading malicious content. Follow the prompts. AdGuard will then be installed. A window will show up asking you to confirm that you want to see a quick guide. Click “Skip” button to close the window and use the default settings, or press “Get Started” to see an quick guidance that will help you get to know AdGuard better. Each time, when you launch your machine, AdGuard will launch automatically and stop unwanted popup ads, block Mac Cleanup Pro pop-ups, as well as other harmful or misleading web pages. Now your MAC system should be clean of the Mac Cleanup Pro and other PUPs. We suggest that you keep AdGuard (to help you stop unwanted pop up ads and unwanted harmful webpages) and MalwareBytes Anti-Malware (MBAM) (to periodically scan your machine for new potentially unwanted programs and other malware). If you are still having problems while trying to delete Mac Cleanup Pro PUP from your Apple Mac, then ask for help here here.